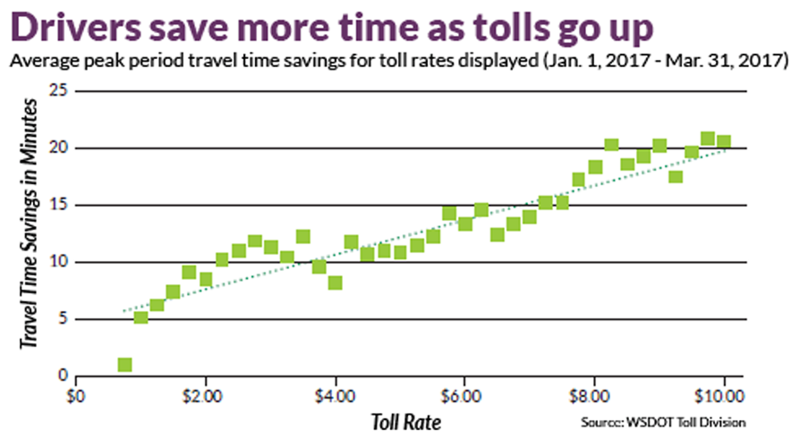 The WSDOT Blog - Washington State Department of Transportation: When are tolls worth it? The time saved for a few is not worth the congestion that the majority of the public goes the on a daily basis. The tolling experiment on I405 has been the biggest mistake in transportation history and one of the biggest ripoffs of the public in recent memory. The extortion tolls were forced onto the public with deception, propaganda and lies. The tolls have made congestion much much worse and everyone knows this. I have been driving I405 for years and I have never seen a project create so much congestion. The tolls have been sending cars on side streets and they have created so much diversion that cars are cutting through neighborhoods where there has never been an issue before. It is awful that the Texas company where some of the toll revenue goes discourages adding general purpose lanes, that way the congestion continues and the toll revenue comes in. What a joke! If the failed extortion lanes are added to the southern part of I405, it will create a traffic catastrophe sending thousands of additional cars through our neighborhoods. The truth is we would all be better off if the extortion toll lane experiment were suspended ASAP! The new and improved configuration would be 4 general purpose lanes and 1 HOV lane. The southern part of I405 would get the additional general purpose lane we desperately need. We were promised 2 general purpose lanes not extortion toll lanes. It's time to do what's right and admit that this experiment was a failure and suspended the toll lanes so we can get traffic moving again. Real Lanes for Real People! So, no mention of the massive increase in commute times in the poor people...err, 'General Purpose' lanes? No mention of the %200 increase in accidents in the Extortion Lane corridor? No mention of incessant lane jumping across the double white lines? No mention of the prevalent cheating of the 3 person carpool requirements? No mention of WSP stating that the whole system is unenforceable? No mention of the total debacle that opening the shoulder to traffic has caused? No mention that the system is failing every requirement needed to keep it past the two year evaluation period? Notice how W$DOT never responds when confronted with facts? I think they finally realize that people are waking up to the fact that W$DOT is the single most corrupt entity in Washington state. They need to be fought, resisted, undermined, blocked, protested and, ultimately, completely scrapped and rebuilt. This blog, and the lies repeatedly stated as fact, is exhibit A.
I absolutely love the toll lanes. It's great to have an option to go faster when needed (to avoid being late to work, to get to a doctors appt, to pick up kids from daycare). The toll lanes make sure that the lanes operate at maximum efficiency/throughput when traffic moves at 45mph. It would be great to toll all the lanes and use economics of pricing to control supply and demand. I'd even be up for the state to sell off the toll lanes to a private entity as many folks don't believe that governments should follow basic capitalistic economics like pricing driving supply and demand.